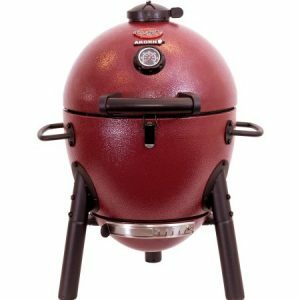 Today, Walmart has Char-Griller AKORN Kamado Jr Sale. Only $109.00 (Reg. $153) with Free Shipping. Ends Soon - Same price at amazon but out of stock for months. Rated 4.5 out of 5 stars. This is a cheap clone of "The Egg" cooker. The Char-Griller AKORN Kamado Jr. Kooker charcoal grill features dual dampers, convenient heat gauge, and cast iron cooking grates to keep flare-ups low. The triple wall steel construction with insulation delivers a superior grilling experience by giving you the ability to grill for longer with less charcoal. Our easy dump ash pan makes clean up quick and easy, the hinged lid allows for easy access to the coals and keeps the lid in place while you cook. The AKORN Kamado Jr. Kooker offers easy mobility and is great for tailgating, camping, the Park or backyard barbecuing.